Most people love to eat, so when you love to cook, dinner company is never too tough to come by. There’s always been one group of friends and family members that seem a little nervous about eating my cooking; this would be, namely, folks who are afraid to have a vegetarian cook for them. The usual explanation has to do with some apprehension over what I’ll put in the food—in particular, whether tofu will be an ingredient. My standard response is to vow to make pasta. Nobody’s afraid of pasta, and pasta doesn’t generally have tofu in it. Well…except this one does. Interestingly enough, the pasta those guests are most likely to request is the one that I’ve decided to throw tofu into: fettuccine Alfredo. The thing that sets this one apart from any that I’ve ever served is that it’s vegan, so there’s bound to be some unexpected ingredients in order to create the rich, creamy goodness my dinner company generally seeks. Cashews were an obvious choice for a vegan Alfredo sauce. They blend up smooth and milky, making an ideal substitute for the heavy cream found in classic Alfredo. The tofu is a bit less obvious of a choice, but it gives the sauce a nice body, so it coats the noodles thickly, just like dairy versions (which sometimes include an egg yolk). To really replicate the fettuccine Alfredo we’ve all grown to love, I included some optional cashew Parmesan in the recipe. This part isn’t an absolute requirement, but if you’re one who goes for heaps of extra cheesiness on your pasta, you’ll appreciate the texture and mild tang that this adds. If the tofu doesn’t scare your dinner guests off (you know, assuming you admitted there’s tofu in here), I’m betting they’ll be a-OK with some kale in their vegan fettuccine Alfredo. And the kale is a welcome addition indeed—not just because the inclusion of some greens makes me feel better about eating one of the most decadent pasta dishes in existence, but because the flavor of some garlicky sautéed kale goes amazingly well with the mild creaminess of the Alfredo sauce. This post was originally published on October 23, 2014. This vegan take on fettuccine Alfredo is made with a creamy cashew sauce that’s made extra thick and luxurious by blending in tofu. Tender bits of garlicky sauteed kale compliment the richness of the Alfredo sauce. Place cashews in a food processor fitted with an S-blade and blend until smooth, stopping to scrape down the sides of bowl as needed. Add the tofu, milk, lemon juice and a pinch of salt and blend until creamy. Taste and add additional salt if desired. Distribute the mixture in an even layer on an ungreased baking sheet. Bake for 3-5 minutes, until the mixture darkens slightly. Remove from the oven and allow to cool. This is best eaten right away, as that’s when the sauce is creamiest. If you wait a few minutes or have leftovers, add a few splashes of soy milk or almond milk to regain some of the creaminess. I’m going to text this recipe to my brother, he would absolutely love this. It does look really tasty. Thanks for sharing & happy Thursday! I hope you do find the time! I think you’ll love it!! This looks absolutely delicious!!! I definitely wouldn’t be apprehensive to eat your food! Haha! Glad to hear it. Thanks Liz! This looks amazing and nutritious! Yum! Yum is right. 🙂 Thanks Millie! If you like veggie lasagna I think you’ll probably dig this as well! Lovely recipe, Alissa. I can see how the cashews would make a creamy sauce and the cashew parm is a must! Pure comfort food! Thank you for sharing! Absolutely! In fact, the weather chilled a bit just as I was getting ready to make it, so I was getting a hankering for some comfort food – it worked out perfectly. Thanks Traci! Making it tonight! I have been making the cheese recipes from Miyoko Schinner’s Artisan vegan cheese so I want to try this since it’s quick. Yes! This is definitely some quick and easy cheezy vegan goodness ;). I hope you enjoy it! Perfect timing! I have a pile of kale in my refrigerator and I didn’t want to do the same old things I usually do with kale. I’ll make this for dinner tomorrow. I’m excited to try it, since I love kale with pasta. This sounds wonderful, but what could I sub for the tofu? Soy and I don’t like each other. Thanks. My first attempt at this didn’t include any tofu. It was quite tasty, just not as thick and creamy as the version with tofu. So you could just leave it out – though you might need to adjust the liquid content a bit and maybe increase the sauce to pasta ratio a bit. I’m currently on a self-enforced wedding diet (not fun!) but am still craving ALL THE COMFORT FOODS. This sounds like a great way to make a healthier version of alfredo sauce. I’ll just have to hide the fact that there’s tofu in it from my fiance! Thanks so much Bec! Enjoy it!! I made this last night for my boyfriend and his two cheese-monster daughters. The ultimate test. They LOVED it! It was so tasty and the texture and consistency of the Cashew-Tofu sauce is exactly what you crave when you want Alfredo. They had NO IDEA it was vegan. Nice work! This was the best fettuccine alfredo I have ever had, hands down (vegan and non-vegan). It was not as rich as the restaurant ones are (which is a good thing) and it tasted delicious! Will definitely be making again in the future. 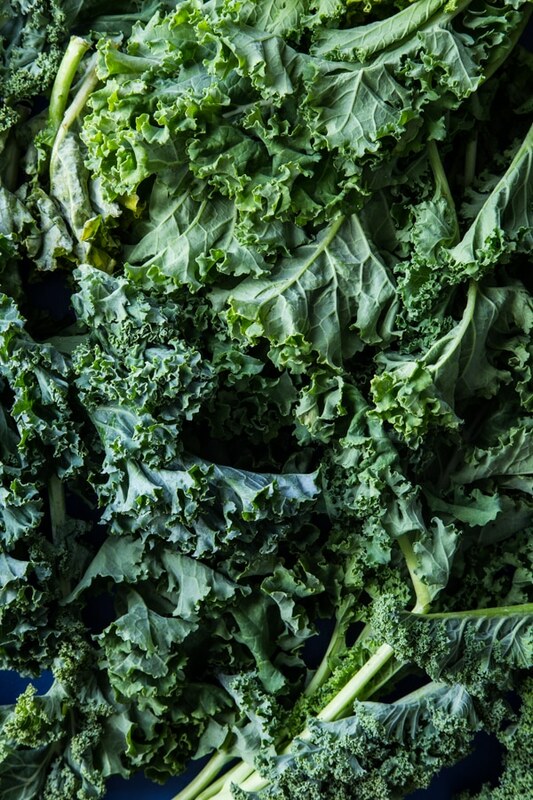 I was looking for inspiration to cook my kale, found your recipe and I am looking forward to trying it!!!! Yay! This is definitely an excellent way to use up some kale. Enjoy!! I made this last night, my sister (meat and dairy queen) couldn’t even tell it was completely vegan!! I accidently added 2 cups of kale. I don’t love kale, as HARD as I try. I’ve literally tried probably 20 different recipes with kale, nothing has really hit it out of the park. BUTTTTTTTTTTTT THIS recipe was fabulous, I liked the oopsy version I made and I can’t wait to make it again with the appropriate amount of kale!! I was wondering, how many calories would you say per serving? Awesome! Glad this one did it for you! I don’t have the nutritional information, but I wouldn’t consider this a low calorie dish. It’s definitely indulgent, though a bit lighter than traditional fettuccine Alfredo. You could take a crack at the calorie calculation using this calculator. I made this, and it’s delicious. My kids also love it. However I served it for a second night, as leftovers, and my son developed hives all over his trunk and groin. He’s had walnuts regularly, I’m wondering in yeast flakes can cause this reaction? I’ve tried googling, and nothing. Glad you enjoyed it, but sorry about your son! I’ve never heard of anyone reacting like that to nutritional yeast, but I guess it’s possible that he could be allergic. I made this for dinner last night and it was amazing! I’ve been craving Alfredo sauce since going vegetarian and gluten free, and haven’t found a sauce that didn’t have eggs or wheat. I’m trying to eat more vegan meals, and this really hit the spot! Thanks for this recipe! “kalefredo”, nice 🙂 haha I really enjoy nutritional yeast. It has a really nice cheesy flavour without being too dense.